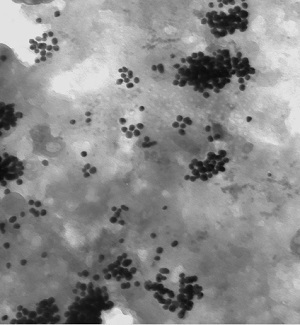 Polymer nanoparticles that are drawn to cancer cells could become an important detection tool, according to a presentation at the annual meeting of the American Chemical Society.The near infrared (NIR) fluorescent nanoparticles are generated from a class of materials referred to as a Group of Uniform Materials Based on Organic Salts (GUMBOS). GUMBOS are largely frozen ionic liquids, although the concept is more general and is also easily applied to solid ionic materials with melting points in excess of 100 °C. In diagnosing cancer, nanoparticles with cancer-seeking properties could be injected into a patient before a medical scan. If even an early form of cancer were present, the particles would accumulate in the abnormal tissue and make it visible for early diagnosis and the best chances for recovery. For treating the disease, nanoparticles would preferentially collect in and destroy only the abnormal cells, sparing healthy tissue from the damage that triggers side effects with existing cancer chemotherapy. Warner acknowledges that his studies are not at this stage yet because, to date, all of their studies are based on in vitro measurements and are still currently under review. “We have a material that is normally toxic to both cancer cells and normal cells,” Warner said. “If we introduce this material in vitro to normal cells, it kills them. Put them in the presence of cancer cells, it kills them. However, when we convert them to our GUMBOS, it only kills cancer cells. That’s basically how it works.”In addition to medical plastics applications, the materials also have potential uses in solar cells and as nanosensors and biomedical imaging reagents.